Cherry blossoms in Washington D.C. are not only a huge attraction, tourism revenue generator but these beautiful trees are an over 100-year-old symbol of friendship between the United States and Japan. But like many flowering plants, the Yoshino cherry trees are being affected by climate change and daylight and heat trigger the tree’s dormancy thus making them bloom earlier each year. As Roll Call explained, warming annual temperatures would likely mean earlier blooms, and average temperatures at the Martin Luther King Memorial have risen 1.3 degrees Celsius (about 2.3 degrees Fahrenheit) between 1895 and 2017, according to Patrick Gonzalez, the National Park Service’s principal climate change scientist. Gonzalez explained that “despite a lot of variation each year, a study of the Tidal Basin cherries found that overall, peak bloom is occurring about a week earlier than when they were first planted” and while any one year doesn’t make a difference, the long term trend is showing a warming planet is having an impact on D.C.’s most iconic trees. Cherry blossoms will likely bloom even earlier in the future, according to a 2011 study published by researchers at the University of Washington. Long term warming could become even more severe: peak bloom dates at the Tidal Basin are likely to be accelerated by an average of five days by 2050 and 10 days by 2080,” the study University of Washington study found. The researchers said the bloom date could come even earlier — 13 days for 2050, and 29 days for 2080s — under a more accelerated global warming scenario. As Climate Central explained, Washington D.C. is not the only area where this has been observed, as similar results have been found for cherry trees in Japan and Korea. 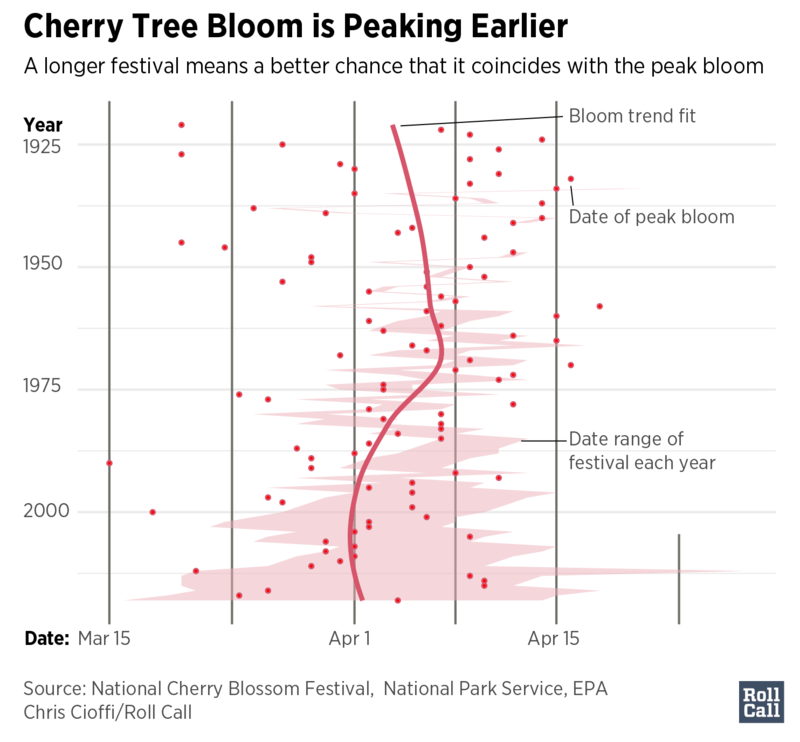 Why This Matters: Patrick Gonzalez explained to Vox in a separate interview what early blooming could mean for the health of the cherry trees and the surrounding ecosystem.